If you’re looking for the best new pool game, Live Billiards is the solution! Have you felt the thrill digital 3d pool? Smooth cue shots, realistic ball movements, the play of light on ivory and bronze, full environmental effects, and a way to talk to your opponents - it's the greatest! 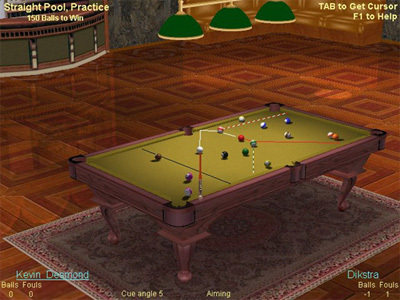 Live Billiards is a comprehensive 3d pool game with impressive graphics. Deluxe version features Straight Pool, 14+1, 3 ball, 8 ball, 9 ball, exotic Pyramid, American, Rotation and DeathMatch games. Live Billiards supports smooth mouse-driven cue shots, and superior ball physics including complex non-center strikes, English, masse, sly ball rotations, ball jumping and take-offs outside the table. Rivaling titles such as VirtualPool by Celeris /Interplay and MaximumPool by Sierra, Live Billiards even includes an MP3 player so you can jam your favorite music while playing! Network mode works over LAN or Internet, supports online competitions, thus maintaining the realism of championship style pool games! In 2005 the newest version 2 of the game was released. Now you can play with computer and listen to his uncommon and extraordinary comments as you play... Tuned ball physics, new Ivory ball set and 5 extra cues bring even more attraction to the gameplay. TESTIMONIALS: "I really never saw any other billiard games so exact and with so much features..."
LiveBilliards also supports dedicated site - the BillYard, Virtual Online Pool Club.